People over 60, historically defined as older, continue to report unrelieved pain to their GP, pharmacist, nurse and care providers. This is despite the fact that as we age we are less likely to report pain, and even after a widely publicised update of national guidance on pain assessment in older people last year. The national guidance followed a review of the literature, which concluded that self-reporting of pain by patients remains the gold standard, even in people with mild dementia. However, it championed the use of a pain tool, coupled with explanation to the person each time it is used. Specific neuropsychological deficits such as memory loss and aphasia require a detailed initial assessment and selection of a suitable tool for the individual. The guidance also proposed using the word ‘sore’, rather than ‘pain’, with some people. This is the Global Year Against Pain in the Most Vulnerable, promoted by the International Association for the Study of Pain. Among those defined as the most vulnerable are older people including those with dementia, infants and young children, people who are cognitively impaired, such as those with learning disabilities, people with psychiatric conditions and survivors of torture. Poor knowledge and implementation of pain assessment and management continue to exist in settings where the nursing team provides most of the care, including nursing homes and residential facilities that are meant to care for the most vulnerable. Those providing day-to-day individualised care are themselves often vulnerable. Care staff may lack access to supported and targeted education, may not be paid a living wage, have limited understanding of the benefit of using a structured pain assessment, and have no voice to raise concerns about the time they are allocated to complete tasks. Pain assessment may be perceived as a task rather than an opportunity to improve care. I was distressed to learn recently of two residents of a private care home who died in severe pain because of delays in providing effective and timely analgesia. 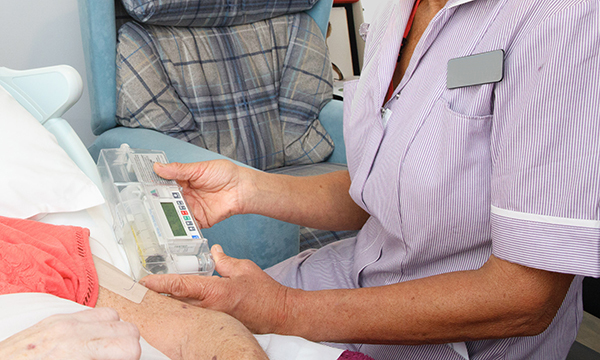 The provider’s response to complaints from relatives was that in addition to all staff having undertaken palliative care training, ‘syringe driver training is available to all nurses’. This is not enough. We as the nursing team need to take ownership and ensure that we undertake training and education to assess pain, and learn about methods to manage pain, as well as how to recognise that someone may be dying. We need to ensure that patients are assessed and offered the most appropriate intervention, and that the effectiveness of the intervention is assessed and recorded. The UK is not alone in having difficulties in this area. A recent pan-European study reported that although nurses had access to a variety of tools to assess pain in patients with cognitive impairment there was limited national guidance about which to use. Many nurses found them difficult to interpret. There are numerous free online educational resources and publications (see box), such as the RCN’s pain knowledge and skills framework. Written by pain nurse specialists, it aims to support and guide registered and unregistered members of the nursing team. The RCN framework covers understanding pain, assessment, self-management, pharmacological and non-pharmacological strategies, and how team members can contribute to ensuring the service is developed, while maintaining the focus on the person who is in pain. No one should have to suffer pain because the need for treatment has not been recognised or analgesia is given too late, and no nurse should lack the training and support they need to be able to assess and manage pain.